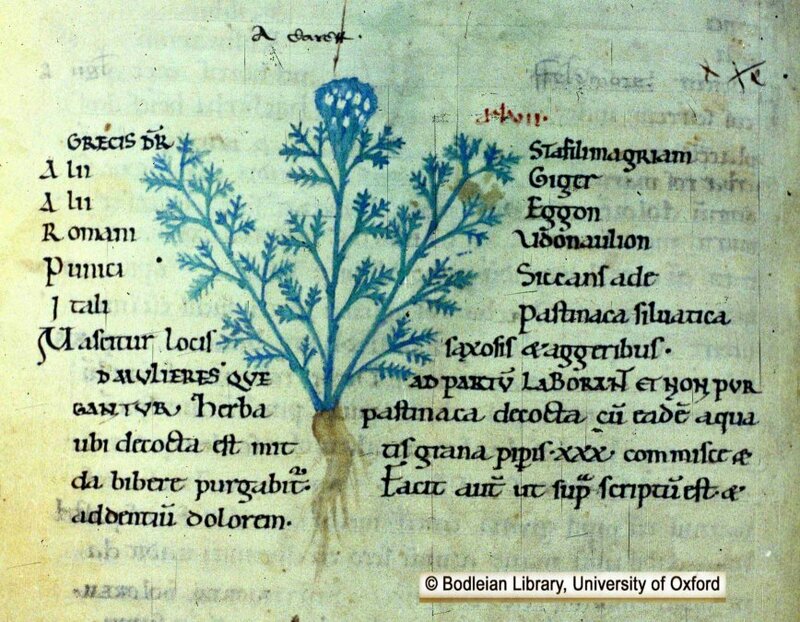 The late 11th century witnessed an intriguing script from Bury St Edmonds, in England - "Pseudo.-Apuleius, Dioscorides, Herbals (extracts); De virtutibus bestiarum in arte medicinae, in Latin and English". This apparently shows a diagram of an orange carrot, which, according to most other historical records did not appear until the 15th century. So another mystery in the origins of modern carrot. 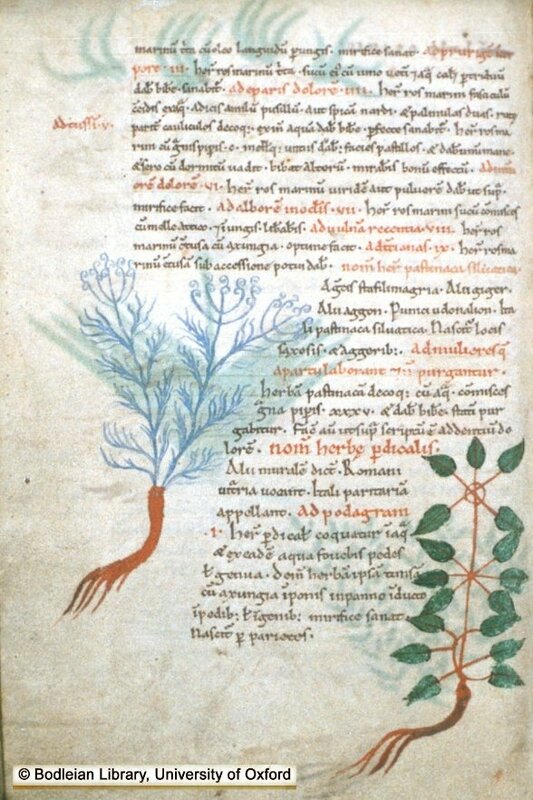 Pastinaca Silvatica is mentioned in the text, which is modern parsnip, but the leaf form is clearly carrot. Carrot and Parsnip was often confused in ancient texts and only properly clarified in 1753 by Linnaeus. Read more here. 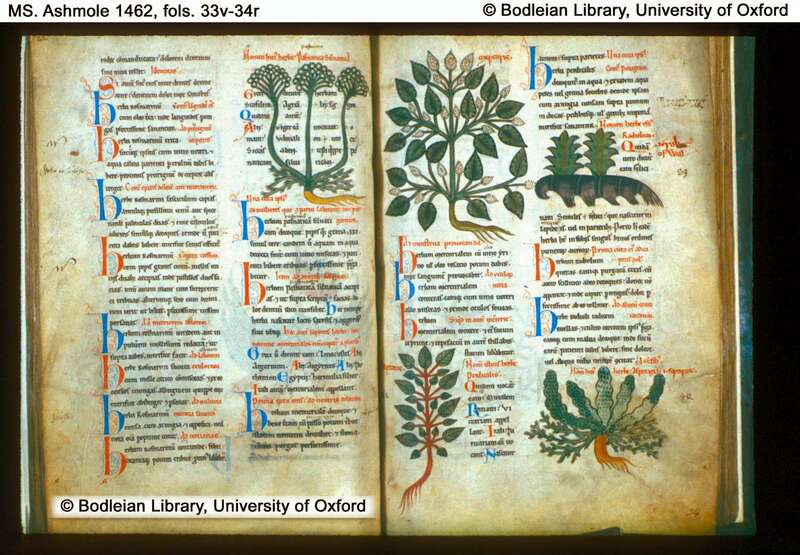 The image (left) appears with kind permission of the Bodleian Library and is copyright and any use is restricted by law. Any unauthorised copying or reproduction will constitute an infringement of copyright. 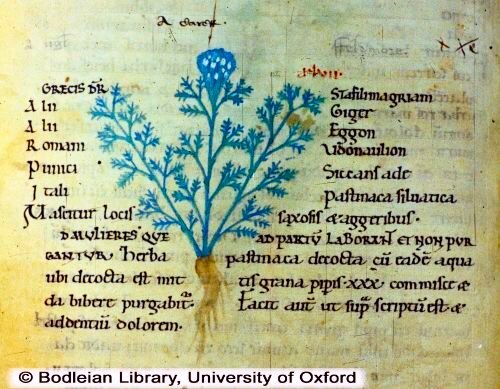 The script is held by the Bodleian Library of Oxford University as part of its collection of illuminated mediaeval manuscripts. Click on image to give a larger version, which will take some time to download, but be patient. MS. Bodl. 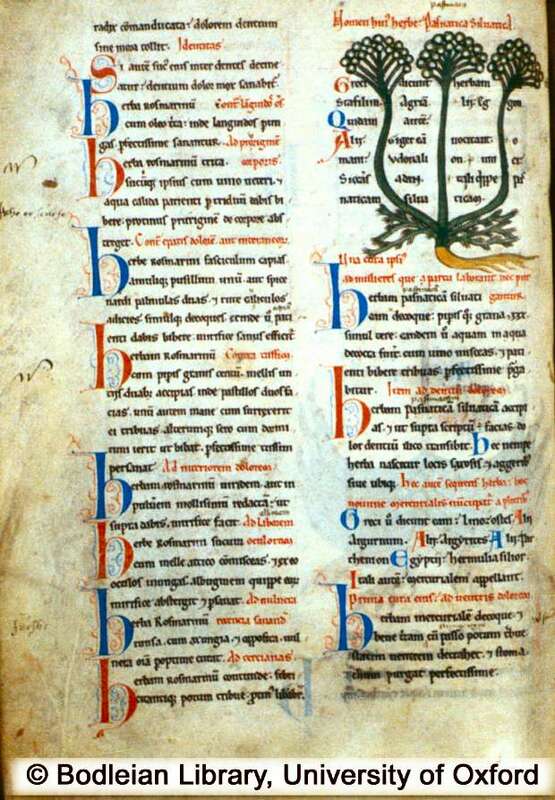 130 is a handwritten manuscript made in the late 11th century at Bury St. Edmunds, containing a copy of a much earlier Latin text; its illustrations are similarly inherited. The original illustrated text had been compiled in the late Roman period (4th or 5th century), doubtless in Italy, by an unknown writer who in turn relied heavily on Greek sources. 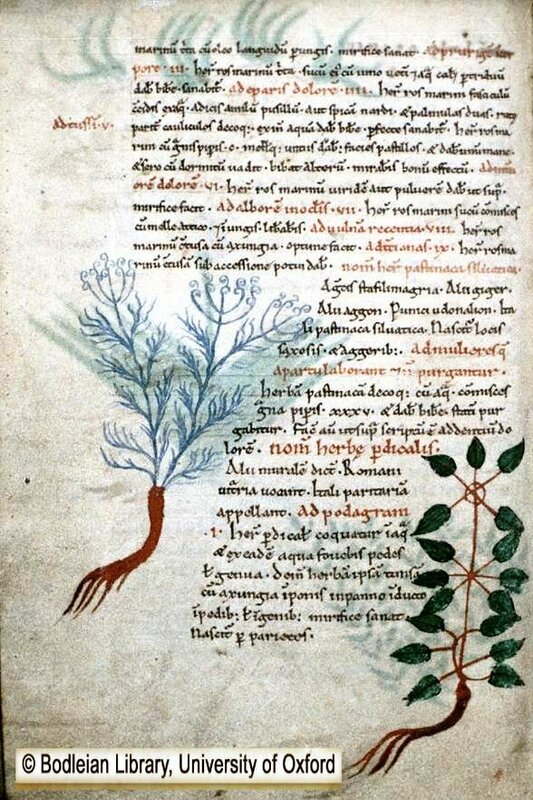 Later, this text became associated -- on no good grounds -- with the name of an earlier Latin writer of the 2nd century AD, Apuleius (of African origin), and accordingly it is still commonly known as the Herbal of Pseudo-Apuleius. Before the age of printing, ancient Roman texts were transmitted in handwritten copies, each of which (since scribes are fallible) contain errors both by its own scribe and as inherited from generations of previous copyists. MS. Bodl. 130 is a relatively late and fairly corrupt version of the original text of Pseudo-Apuleius -- and the pictures were liable to similar corruption in the processes of transmission. The text on the carrot on fol. 23v varies fairly considerably from that of the Howald/Sigerist edition, mostly I suspect by accidental error rather than by design -- for example, it seems to conflate two medical recipes for childbirth problems into one. the Itali [Calabria region, southern Italy] call it 'Pastinaca siluatica'. It grows in stony places and mounds. FOR WOMEN WHO SUFFER AT CHILDBIRTH AND ARE NOT PURGED. With 'Herba pastinaca', cooked, together with the same water in which it was cooked, you take 30 peppercorns; mix together and give to drink; she will be purged. The same recipe as written above also works against toothache." Many thanks to Dr. B. C. Barker-Benfield Senior Assistant Librarian, Department of Special Collections & Western Manuscripts, Bodleian Library for the above translation and background information. Similar scripts - MS. Ashmole 1462 and MS Ashmole 1431 contain the same Pseudo-Apuleian text as MS. Bodl. 130, though with some slight variations in wording. You will notice a typo! "Pasnatica" instead of "Pastinaca" - a typical transcription error in such scripts. This again gives a remedy for toothache. Otherwise the same recipes and place names as in the MS Bodley script referred to above. The carrot leaves and flower do look quite accurate and no doubt orange is the root colour! Click on photos for full picture - note this a large file and will take a while to download. Note: Both have orange tinged roots! Important Copyright Notice: The images (above) appear with the kind permission of the Bodleian Library and are copyright and any use is restricted by law. Any unauthorised copying or reproduction will constitute an infringement of copyright.